These remarks were begun before the spellbinding Avis de Tempête (Cyprès CYP5621) came my way. Ever since encountering Récitations (Naïve MO 782118) in a Mexico City Tower Records discount bin, I’ve eagerly sought other Aperghis recordings. I perceive this Greek-born French resident’s fusions of text and music as reflecting humanity’s primal need to communicate. Highbrow listeners may cringe at the suggestion, but Aperghis’ passionate oeuvre inhabits theater and music’s intersection. Non-Francophones are of course at a disadvantage yet may still appreciate his lively and inventive sound-world. For further thoughts see here. Meanwhile, it’s time to fill in the gaps with some recent and obscure releases. 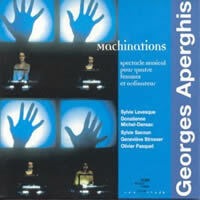 Georges APERGHIS: Machinations (2000). Sylvie Levesque, Donatienne Michel-Dansac, Sylvie Sacoun, Geneviève Strosser (voices), Olivier Pasquet (computer). Accord 472 916-2 (http://www.universalmusic.fr/). Distributed in the US by Premiere Music Distributors (http://www.premieremusic.net/). Before Avis de Tempête there was Machinations. Both of these remarkable works combine live performance with computer manipulation. In ten parts, Machinations applies IRCAM’s mighty toys to the production of a “musical spectacle for four women and computer.” Spectacle is right. The women stand behind illuminated tables over which they make hand gestures and manipulate objects. Big screens above project the tables’ activities. 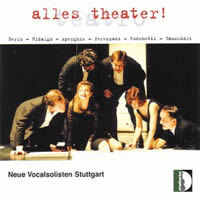 This CD captures a live performance’s audio: We see neither the quartet’s nor the computer technician’s actions, but we do hear the voiced shenanigans and electronic transformations. While computer-enhanced sounds are impressive, the women’s vocal acrobatics are phenomenal. Texts, such as they are, were crafted by François Regnault and Aperghis. Not all the performers are professional vocalists: Strosser is a violist, Sacoun plays the flute, and Levesque acts. Michel-Dansac, an Aperghis regular, is the only trained singer. (There is also a male voice but it’s not clear to whom it belongs.) The patter comprises phonemes and what sounds like French nonsense. The vocalists whine, exhale and hiccup, unleash guttural sounds, extend aspirates and distort diphthongs. It is a laryngologist’s dream. Much of Aperghis’ work is hammered out and refined in rehearsal, relying upon the performers’ skill and the moment’s magic. The excitement of discovery and the exceeding of boundaries are palpable. There’s no story, merely the bare suggestion of a 51-minute creation myth, alternately grating, inviting, sensual and terrifying — the reenactment of a forgotten culture’s precious ritual. Even though the CD presents only part of the experience, Machinations is something you won’t want to miss. 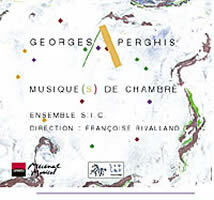 “Musique de Chambre.” Georges APERGHIS: Cinq pièces pour espérou et violoncelle (1994); Faux-mouvement (1995); Les secrets élémentaires (1998); Requiem furtif (1998); La nuit en tête (2000). Ensemble S:I,C. : Eléna Andreyev (cello), Françoise Rivalland (dir., espérou, hyoshigi, percussion), Anne Mercier (violin), Gilles Deliège (viola), Vincent Leterme (piano), Donatienne Michel-Dansac (sop. ), Sophie Deshayes (flute), Pierre Dutrieu (bass clar.). Zig Zag Territories ZZT 020501 (http://www.outhere-music.com/en/labels/zig-zag-territoires). Distributed in the US by Harmonia Mundi (http://www.harmoniamundi.com/). The espérou is an odd percussion instrument created expressly to realize the Cinq pièces. Percussionist Rivalland and cellist Andreyev collaborated with Sylvian Ravasse on a zither-like contraption with metal rods which, when pushed into its wooden body, cause sympathetic strings to vibrate. (They can also be bowed or plucked.) Rivalland characterizes the instrument as a “sick cello.” It whistles and whines like a squeaky door complementing the cello’s harmonics. Both players vocalize in this odd, intimate duet that, heard from afar, resembles hushed conversation. With Aperghis, there’s always an elephant in the room: a hidden text, opaque references lost on a recording. Titles with “faux,” “secrets,” “furtif” suggest as much. The crisply episodic Faux-mouvement for string trio seems to mourn a missing violinist, as if some meaning would become clear if only the work were for string quartet. Les secrets élémentaires is a 13-piece collection for solo piano Satie would have admired. Some miniatures, like “no. X,” do no more than amble languidly like a breeze in a tree, through a small pitch grouping. Twisting fragmentary passages result in jerky rhythms. As with Faux-mouvement, this set seems stalled as if waiting for something to egg it along. Hyoshigi are Japanese wood clappers used to signal the start and end of performances. Aperghis unites a set with violin for Requiem furtif, which doesn’t complement Faux-mouvement as much as one might expect. The clappers snap quickly and repeatedly, as if in pursuit of a pesky bug. The violin speaks in staccato and hushed tones. Concluding this predominantly instrumental release, La nuit en tête requires soprano, violin, cello, flute, bass clarinet, piano and percussion. Their neurotic yet tender whirrings mask the voice’s dribbling. Georges APERGHIS: Tingel Tangel (1990); Jactations (1992). Frédéric Daverio (accordion), Françoise Rivalland (percussion, cimbalom), Valérie Philippin (sop. ); Lionel Peintre (bar.). Vand’Oeuvre VDO 0426 (http://www.centremalraux.com/). Scored for an improbable trio of soprano, accordion and cimbalom, the wry Tingel Tangel flirts with cabaret. In semi-incoherent quasi-French, its text skirts the circus, masquerades and death. Not an easy entry into Aperghis’ world, but those familiar with the terrain will be satisfied. High-pitched — almost tarty — Philippin’s strident coloratura must also declaim and patter. Rivalland also vocalizes, most evidently during the opening Prologue, with its own applause. The accordion / cimbalom combo often sounds vaguely electronic, though I doubt that was the composer’s intention. Slightly detuned, they suggest malaise, perhaps a debaucher’s final throes. In performance the players’ expert motions surely contradict this: one pulling and pushing as the other strikes strings and objects with mallets. “East Meets West.” Francis MIROGLIO: two versions of Extensions 2 (1970). Alain LOUVIER: Shima (1970); Çandrakâla (1970). Georges APERGHIS: Kryptogramma (1970). 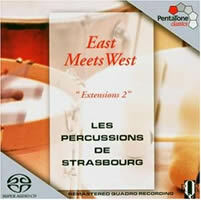 Les Percussions de Strasbourg. PentaTone PTC 5186 156 (http://www.pentatonemusic.com/). Distributed in the US by Naxos (http://www.naxos.com). Into SACD format, PentaTone reissues a clutch of May 1972 tapes originally released under Philips’ “prospective 21e siècle” imprint. Each piece is scored for kitchen-sink percussion ensemble. (What else would you expect from the able-handed Percussions de Strasbourg?) Running every which way, both voluble versions of Miroglio’s Extensions 2 (an underrecorded composer) employ “formes mobiles,” the wide timbral range of which absorbs crackling xylophone, bowed cymbals and slide whistle. Louvier’s two through-composed multi-section offerings are more atmospheric. Shima passes through an alluring tinkling section. An early piece from Aperghis’ catalogue, Kryptogramma, constructs variations from the rhythms of classical masterpieces. Instruments are used in homogenous bunches: an ensemble of castanets, marimbas, non-pitched drums, etc. There’s also something that sounds like an airbrush. Among this collection, delicate Aperghis wears best. “alles theater!” Georges APERGHIS: Petrrohl (2001). Manuel HIDALGO: Cuatro Citas de Juan Goytisolo (1999). Lucia RONCHETTI: Anatra al sal (2000). Luciano BERIO: Sequenza III (1966). Paolo PEREZZANI: All for Company (2002). Carola BAUCKHOLT: nein allein (1999/2000). Neue Vocalsolisten Stuttgart: Angelika Luz, Susanne Leitz-Lorey (sop. ), Stephanie Field (m.-sop. ), Daniel Gloger (c.-tenor), Martin Nagy (tenor), Guillermo Anzorena (bar. ), Andreas Fischer (bass). Stradivarius STR 33680 (http://www.stradivarius.it/). Distributed in the US by Allegro Music (http://www.allegro-music.com/). A proven new-music ensemble, the Neue Vocalsolisten Stuttgart conquer theatrical contemporary music with ease. They’re the singing voices in Ferneyhough’s ambitious quasi-opera Shadowtime (NMC D123). Like much of the “Donaueschinger Musiktage 2002” yearbook, reviewed here, these six a cappella pieces are awkward without visuals. It doesn’t help that so many composers mistakenly believe that extroverted vocal techniques automatically enhance texts. The Berio and Aperghis are exceptions, conveying expression through macerated syllables. Aperghis’ six-voice Petrrohl leads the pack, as its barely comprehensible vocalizations cannot be understood linearly. An eponymous work by the schizophrenic painter Adolf Wölfli inspired Aperghis’ nonsense soup. Berio’s Sequenza III, for all its one-time modernity, reveals itself as just another text setting as the solo soprano divulges bits of Markus Kutter’s poem. Lachenmann-disciple Hidalgo’s Cuatro Citas de Juan Goytisolo is a duet for soprano and countertenor, though other voices speak from below. Ronchetti’s “Duck with salt” is a six-part sung recipe; Perezzani’s All for Company takes up some Beckett, and Kagel collaborator Bauckholt visits music-theatre’s well-trodden furrows. “En Sonate.” Var. works incl. Georges APERGHIS: Profils (1998). Sonia Wieder-Atherton (cello), Françoise Rivalland (zarb). RCA 82876 552732 (http://www.sonymasterworks.com/). 2CDs. It would be unfair to wonderful cellist Wieder-Atherton (http://www.soniawiederatherton.com/) to fold this in as just another Aperghis sighting. A grand splash, this two-CD collection (some reissues, some fresh cuts) pushes other cellists aside. The first disc pairs the cellist with pianist Imogen Cooper in the Rachmaninov sonata and pieces by Liszt and Schubert, including a perfect “Arpeggione.” Piano and cello are balanced partners, a joy to hear. On the second disc, violinist Raphaël Oleg joins Wieder-Atherton in excellent performances of the Kodály and Ravel duos, and Glière’s unfamiliar Eight Duos. No stranger to contemporary music, Wieder-Atherton is the soloist in Dusapin’s odd and gloomy cello concerto, Celo (the first movement is played with a rosin-less bow), on Naïve MO 782153. Aperghis’ 12-minute Profils is for cello and zarb. As with Zig Zag’s disc featuring the espérou, percussionist Rivalland demonstrates her experimental bent. The zarb is a traditional chalice-shaped Persian drum which can produce non-pitched and knocking sounds. Aperghis’ writing is predictably athletic and sensual. The contrasting instruments, rarely meshing, jostle each other like passengers on an overcrowded bus. The zarb’s tangy resonance is grippingly recorded. Aperghis is rare stateside. Finally, Accord has become readily available in the US, distributed by Premiere Music Distributors (http://www.premieremusic.net/), though I snagged this title from Universal Music France (http://www.universalmusic.fr/). I ordered the Vand’Oeuvre disc directly from the Centre Culturel André Malraux (http://www.centremalraux.com/), and the Stradivarius release directly from the source (http://www.stradivarius.it/) even though it’s distributed in the US by Allegro Music (http://www.allegro-music.com/). 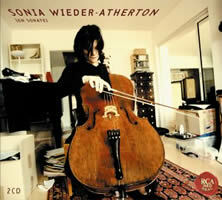 Sony-BMG-RCA’s online classical presence has suffered since their reorgs, but do seek out Wieder-Atherton’s 2CD set! Other reliable French sources include Amazon.fr (http://www.amazon.fr/) and Fnac.com (http://www.fnac.com/). Overseas shipping and insurance swell the tab, but it’s worth it.